Whether you’re looking for a new job or simply looking to supplement your existing one, a side gig is a great way to boost your income. There are more opportunities, both online and offline to earn extra income, than you might think — and more hours in the day than you might realize. Many jobs that were traditionally available only in an office or other on-site workplace are now available as side gigs for freelancers or part-timers. Although most side hustles aren’t a “get rich quick” trick, you could reasonably expect to earn anywhere from an extra $2,000 to $10,000 per year, depending on your skill set and on how much time you invest. Here are some ideas to get started. 1. Become an administrative assistant. Small businesses are often in need of help, whether it’s on a temporary, one-time or ongoing basis. Approach local establishments in your neighborhood — even better if they’re companies you already have a relationship with — and offer your services helping organize paperwork, entering data, answering phones or assisting with any other administrative tasks they may need help with. You can start by sending an email or phone call, but you will make the best impression by stopping by in person, dressed to impress with a resume in hand. Read more about how to find a job as an administrative assistant. 2. Write. If you have writing skills, consider starting your own blog. You can monetize your blog with advertisements or affiliate links. Alternatively, you can pick up gigs as a freelance content or marketing writer. Check out sites like Upwork to find remote writing jobs across multiple topics. If you've got top-notch copy editing and proofreading skills, check out editorr as an option to monetize your skills. 3. Become a virtual assistant. Prefer to work from home? There is a huge need for virtual assistants, and as long as you have basic communication and organization skills, the field is highly accessible with a low barrier of entry. Check out sites like Upwork, FlexJobs, VirtualAssistants.com or browse remote job boards. Expect tasks like data entry, transcription, calling, caption writing and general administrative work. Learn about what a virtual assistant does and how to become one. 4. Work as a user tester. User testing allows web designers and developers to get feedback on their work. Sites like UserTesting.com employ remote testers who can earn up to $10 per test. You can also search for local “user testing,” “user research” or “panel” gigs in your city. The “Gigs” section on Craigslist is a great place to find local opportunities. You may also see opportunities to participate in medical or psychological research, though these tend to be more difficult to get as each study is likely to have very specific participant parameters. 5. 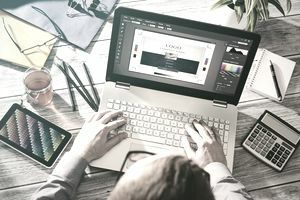 Get started as a graphic designer. If you’re computer-savvy and creatively inclined, graphic design is a great side hustle. Not sure how to get started? Check out 99Designs, where you can participate in design contests and get paid if your creation gets selected. Even if you don’t win, you’ll come away with images to add to your portfolio. Plus, sites like Canva make it possible to create beautiful images without investing in expensive design software. Brush up on the skills you need to succeed as a graphic designer. 6. Sell to stock photography sites. Have a knack with a camera? You can sell your photography to sites like Shutterstock, iStock or Getty Images and get continuous income from the images they pick up. If you’re not so much a photographer yourself but have some photography or artistic experience, you could also apply to be an image reviewer, where you can work from home and review images that are submitted by photographers. 7. Take care of pets. Apps and websites like Rover, Wag, and DogVacay make it easier than ever to score dog walking and pet sitting gigs. You can also go the old-school route and post flyers at your local cafe, vet’s office or pet store. Learn how to start a dog walking business. 8. Work in social media. Social media platforms, Instagram especially, are hugely popular among brands looking to market their goods and services. Accordingly, there is money to be made here, in a couple of different ways. First, you could try your luck as a social media influencer, building up your page to get followers. Once you hit 1,000 to 2,000 followers, you may start hearing from brands who want to pay you (or offer you free products) to post about them. Or, you could get started as a social media marketer, reaching out to local businesses and offering to take over their social media accounts, post on their behalf and ramp up their followers and number of likes. 9. Become a tutor. You can work as a tutor for elementary, middle or high-schoolers, or tutor adults who are looking to learn English or basic computer skills, for example. There are multiple platforms offering online tutoring jobs and freelance tutoring gigs, like Wyzant, for example. Some tutors have even had success independently hosting tutoring sessions over Skype and Google Hangouts. Check out what companies and clients are looking for in a tutor. 10. Teach a course. If you have expertise, sell it! Sites like Udemy.com allow you to leverage your personal and professional knowledge by creating and monetizing online courses and workshops. 11. Work as a production assistant. If you live in a city with a high volume of television and film work (think New York City or Los Angeles), search online or ask around for freelance or part-time production assistant gigs. Although the work isn’t always consistent and the days can be long, you can expect to make anywhere from $100 — $200 per day. See what skills you need to work in the film and television industry. 12. Take on microjobs. A microjob is a quick and usually one-time gig. Check out Fiverr where you can sell anything from blog posts, to illustrations, to audio transcriptions and more. Amazon’s Mechanical Turk platform also provides multiple opportunities where you can complete quick, repetitive tasks for a smaller amount of money. If you’re looking to work offline, TaskRabbit will connect you to various gigs in your area. You can also make money participating in online focus groups which don't require a big investment of your time. 13. Work as a coach or consultant. If you prefer to share your expertise interactively, either one-on-one or with small groups, consider becoming a coach or consultant. Clarity.fm is a great place to get started if you have business or technical knowledge to share. However, try to think outside the box! If you can make yourself a website or even a Facebook page, you can market and sell your expertise — whether it’s anything from interior design to managing kids’ schedules to vacation planning. You’d be surprised what people will pay for. Read up on how to become a consultant. 14. Work as a driver. Companies like Uber, Lyft, Juno, Via and Gett make it easier than ever to get a job earning money as a driver. Prefer your bike or legs to a car? PostMates makes it possible to earn money as a delivery person. 15. Do handy work. There will always be a need for handy work around the house, whether that’s cleaning, mowing the lawn, shoveling snow, or doing repairs. While traditional routes like posting flyers or browsing Craigslist gigs are still fruitful, platforms like Handy.com, Taskrabbit.com, and Mrhandyman.com make it easy to find freelance gigs to earn some extra income on the side. Get an easy in by looking for a seasonal handyman or helper job. 16. Become a seller. Although selling on eBay is an art form, you can start by seeing what you can sell around your house. Start with your closet and consider an app like Poshmark, where you can make hundreds of dollars a month selling clothing, shoes, and accessories that you no longer wear. 17. Work as a customer service representative. Although you’ll need strong communication skills and an empathetic and patient attitude, customer service jobs are increasingly available on a freelance, remote, and part-time basis through remote work sites or by applying directly to companies that hire remote staff. Read about what you might be asked when applying for customer service gigs.